Return to Harlem’s “wildly entertaining” family in this funny, heartwarming sequel. 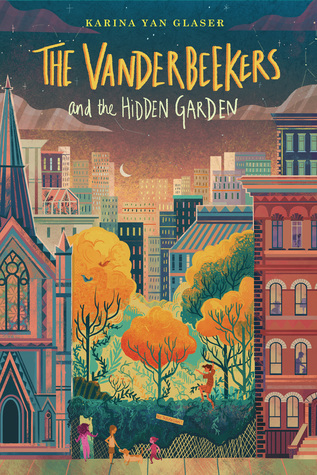 When catastrophe strikes their beloved upstairs neighbors, the Vanderbeeker children set out to build the best, most magical healing garden in Harlem–in spite of a locked fence, thistles and trash, and the conflicting plans of a wealthy real estate developer. Do you ever read a book that makes you teary-eyed the entire time, because the book is just so lovely and wonderful? Because that’s definitely what this book did for me. I already fell in love with the Vanderbeeker family, a biracial family with five kids and their pets living in Harlem, while reading the first book in this series, The Vanderbeekers of 141st street. Every single member of the family is incredibly loving and caring, but they’re also all their own person. Usually when I’m reading a book with quite a few characters they end up kind of blurring together, but that definitely didn’t happen with this book. I can remember every single name and even the things that make each of these characters unique, and from someone as forgetful as I am, that’s quite high praise. In this book, The Vanderbeeker kids try to create a garden for their upstairs neighbors, Mr. Jeet and Miss Josie, after Mr. Jeet has a stroke. The kids were incredibly worried about Mr. Jeet (and after falling in love with his character in book one, I was right there with them), but the fact that they managed to distract themselves by putting so much energy in making this garden was lovely to see. I loved reading about the garden. I loved reading about the kids working in it, about them learning about plants, about them trying to save it, etc. And I also quite enjoyed all of the Secret Garden references. Just, the entire book was so wonderful. Honestly, I love everything about this book. The characters, their adventures, the way it doesn’t shy away from more serious topics, the messages it sends, etc. In my opinion, this is the perfect middle grade book, and I know I’ll probably reread it many times. Also, in case you were wondering; yes, writing this review made me tear up again. Please don’t judge me. For some reason I thought you’ve already read this? Maybe I was just thinking of the first book. This sounds like such a wholesome series and I’m glad you enjoyed it. Also, the cover is beautiful.